Submitted by NOLAGuy on Sun, 07/25/2010 - 9:44pm. 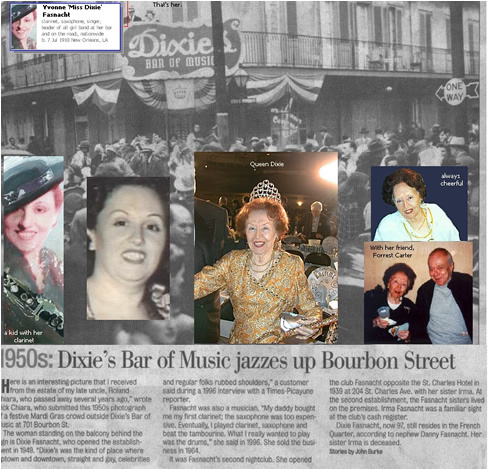 The Fasnacht sisters, Dixie and Irma, opened Dixie’s Bar of Music on 200 block of St. Charles Avenue in New Orleans in 1939. The house band included Dixie herself on clarinet, Judy Ertle on trumpet, Johnny Senac on bass, and Dorothy "Sloopy" Sloop on piano. Advertised as "New Orleans’ Biggest Little Club," Dixie’s became a favorite hangout of local and visiting national entertainers. 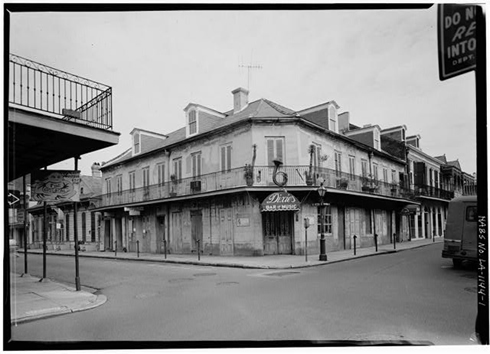 In 1949, the club was moved to the Bourbon Street in the French Quarter, where it remained a popular spot until it closed in the late 1960s. However true, but now the real story! "Dixie's Bar of Music" on Bourbon St. When the first gay carnival ball was raided and attendees jailed, she open her cash register, put the money in a paper bag, and set it off with one of her customers to "get the boys back" many who were regular patrons at Dixie's. The sisters retired from business over 40 years ago, but continued to fuel the social life of the French Quarter. 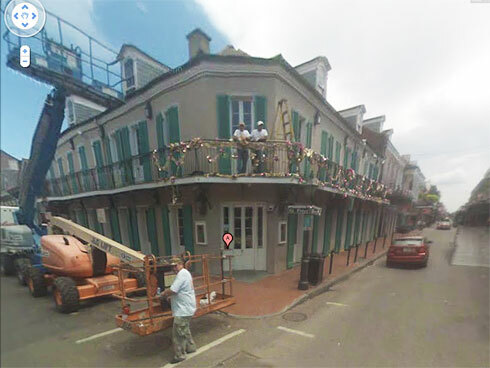 Until recently, they hosted all-day Mardi Gras parties at their Bourbon St. home (with interior patio), every year. There, one could find street-people chatting, eating and drinking with corporate CEOs or celebs. Above all else, one could find a bath room, asprins and delightfully interesting folks. Miss Dixie continued these parties, after the sad loss of her beloved sister. Fasnacht is a Swiss-German synonym for Mardi Gras. An icon of New Orleans gay community, Miss Dixie celebrated her one-hundredth birthday, this year! Submitted by Infrogmation on Sat, 07/24/2010 - 9:14pm. What, a reference to "Bayou Pom Pom" passes over the heads of kids these days? Back in the day, the mere mention of this fictional place would raise smiles. The Cajun one-horse town of Bayou Pom-Pom was invented by Louisiana comedian Walter Coquille. His comic monologue "The Mayor of Bayou Pom-Pom" was released on Brunswick Records in 1929, and sold so well that he was brought back to record a number of sequels. This was the first recording of Cajun humor, long before Justin Wilson. Submitted by Erica on Tue, 07/13/2010 - 3:05pm. We have a West Indian corner market here in Springfield, Mass., called the Pim Pum, which always strikes me as odd. I wonder if Pom Pom and Pim Pum are related and how they relate to groceries. I guess I'll have to stop into the Pim Pum one day and ask them about their name. Submitted by Mr Mel on Sun, 07/11/2010 - 3:06pm. Victor Borge had a similar story about a chemist who compounded a new lemon flavored carbonated drink. He called it "5 Up", he put it on the market in 1925 but it didn't sell enough to make it worthwhile. He went back to his lab and reworked the formula, found another backer and released it again in 1928. This time he called it "6 Up", it too failed. He died shortly after, of a broken heart, never knowing how close he came. Submitted by Anonymous Tipster on Sun, 07/11/2010 - 6:10am. My Uncle Sid salvaged an old bar complete with back shelves and installed them in his basement in the mid 50's. As a eight year old, I coveted the big chrome plated Pepsi-Cola soda fountain tap he had. It was complete with the red, white and blue Pepsi logo and contained a music box which played the Pepsi jingle when the tap was activated. My Uncle Ernest was a chemist for Pepsi. He compounded the flavor essence that went into the syrup. I remember going to the corner "party store", as we called them in Detroit, on hot summer days in the 50's and getting a Pepsi or Coke out of the cooler filed with ice water. Although the "pop" was only ten cents, we drank it on the premises to avoid the two cents deposit which we spent on penny candy or baseball cards. Submitted by Jimmy Longshanks on Sun, 07/11/2010 - 12:53am. Rouses Grocery at 701 Royal, Quartermaster Deli and Market at 1100 Bourbon. Sadly, the Verti Marte at 1201 Royal burned earlier this year. I'll take two loaves of Liedenhiemer's bread and a Hubigs pie, peach. Submitted by Anonymous Tipster on Sat, 07/10/2010 - 5:15pm. The price on the oysters seem quite reasonable! "Twice as much for a nickel too"
Submitted by Anonymous Tipster on Sat, 07/10/2010 - 3:58pm. In South Carolina they sang "Twice as much for a penny more". We had a tax that made Coke six cents and Pepsi seven cents. S.C. is often a little strange. Submitted by Anonymous Tipster on Sat, 07/10/2010 - 2:42pm. This location is now the home of The Cat's Meow, which bills itself as World's Best Karaoke Bar. Looks like the lamppost/street sign has survived, though! Submitted by OTY on Sat, 07/10/2010 - 2:34pm. 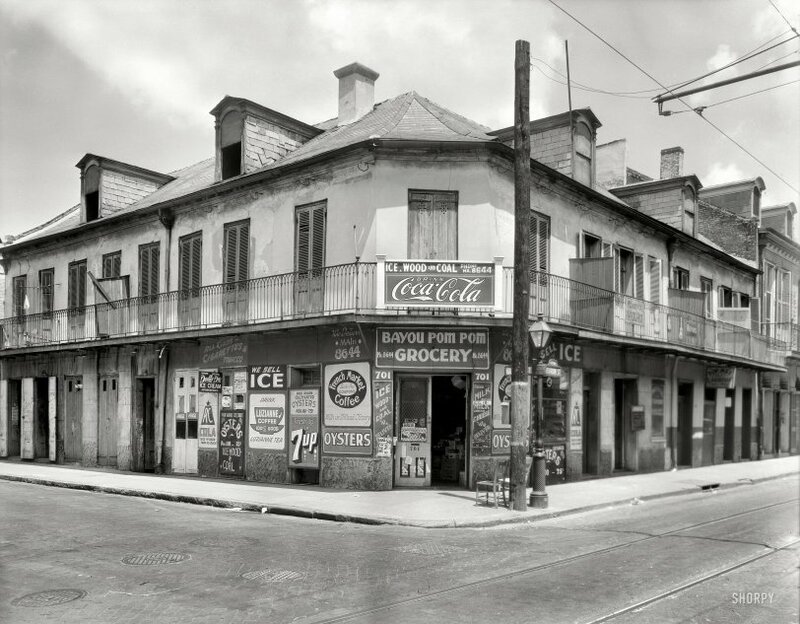 Don't think there are any grocery stores on Bourbon Street anymore. My last stay in N.O.L.A. was in 1995 when our Saturday night on Bourbon Street consisted only of the above, but I could be wrong. The ravages of old age make it unlikely that I will ever return there but I've had my share of "smokin', drinkin, doin' the hootchy coo." Still, its nice to reminisce as I mull over the song "Don't get around much anymore." Life is good, rejoice and be glad. "Twice as good, twice as much"
Submitted by Mr Mel on Sat, 07/10/2010 - 1:56pm. By 1939, Pepsi's sales had doubled.